Do you ever forget how old your children are? Last night, returning from four days in New York City, I was greeted by a Lena much older than the one I had in my head. I picked her up, she wrapped her lanky legs around me, and I tried to squeeze THIS Lena, Lena-almost-eight, into my understanding of my baby girl. The sudden sense of lapsed time reminded me of an essay I had written years ago, about Lena’s big brothers. In this essay they are toddlers; as I write they are middle-schoolers playing ping-pong in the basement. We were in the front yard and a plane flew overhead, close, loud, breaking the peace of the still summer Sunday. Noah didn’t notice. As an 18-month-old, he would have jumped and squealed and shouted “airplane” or at the very least found and followed the roaring jet with his eyes. As a 2 1/2-year-old, he didn’t even look up. That could be the beginning of a tragic story: the child whose deafness is discovered one sunny day in July. Instead it is simply the story of growing up. Noah was too busy to notice a plane. He had been riding his trike, towing a pink baby doll stroller to the repair shop by the seaside, the seaside being the destination of all excursions, and repair being, I’m sorry to say, the eventual fate of all vehicles. In fact the trike didn’t even get all the way to the repair shop; Noah had to make an emergency mid-sidewalk stop to fix it. 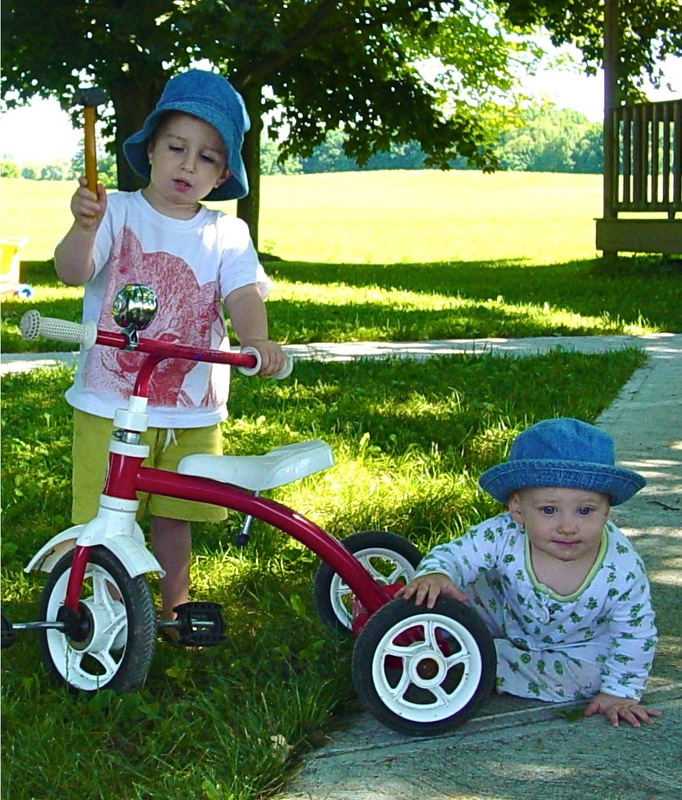 He was peering at his trike, diagnosing the problem, when the jet flew overhead. His baby brother, Jesse, who had been petting grass and searching for a loose stone to put in his mouth, threw his head back to gawk and nearly tipped over. “I think it’s the timing chain,” said Noah, and wiggled a stick around the wheel spokes while grimacing and grunting with the immense effort of grunting and grimacing. Meanwhile, I sat amazed that, just two and a half years after he first laid ears on the world, Noah’s own thoughts could drown out the roar of a jet. He was beginning to build a world inside himself, which thrilled me and scared me too: Some day I would be excluded from that world. The plane disappeared into the clouds. Some day, Noah will be in the back seat of the car, singing to himself a song I’ve never heard. He will come home chattering from school and I’ll have no idea what he’s talking about. Today it was pretty easy. I knew that watching Thomas the Tank Engine videos gave Noah “repair shop” and “seaside,” and that watching his father maintain the farm machinery taught him “timing chain” and the concept of constant vehicular failure. And because I am still in the know, I can still be in the world. “Yes we can!” Noah is also enamored of Bob the Builder. “Do you want the hammer or the pliers?” he asked, and he ran back to the sandbox for his tools. I wanted the hammer but I got the pliers. Which gave me a glimpse of what it might be like for Noah’s younger brother to play with him in the future. Jesse looked up again, transfixed by the banging of the hammer. And I smiled because he still lives in the world outside his head, and that world is open to anyone willing to pay attention to it. That’s not always as easy as it sounds: babies notice not just the roar of the jumbo jets, but the creak of the rocking chair, the whimper of the cat at the front door. The rustle of petted grass. Once when Noah was Jesse’s age I was holding him on my right hip while stirring a pot of sauce with my left hand. And he kept looking down at the pot then up, down and up, over and over. I stopped stirring and I stared until I could see. He was following the steam. Gauzy white and willowy and almost invisible to the adult absorbed in her own thoughts. “OK, I think we got it,” said Noah, tossing aside the hammer. “Ready,” I said. After a few feet we stopped, though nothing appeared to be blocking our path.